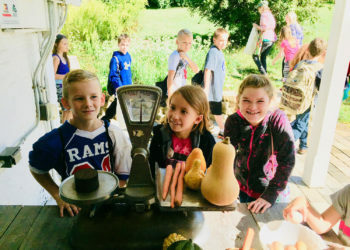 Our farm-based education staff is passionate about providing hands-on experiences for all learners, including homeschool families! We are here to help provide you and your children a successful, enjoyable, and educational experience while on the farm. Live the history of Ohio during the 1800s. Students will learn the story of the Funderbergs, the pioneer family who first settled on what is now Learning Tree Farm. They will get a sense of farm life as they work with our staff at multiple stations. Students will use authentic 19th century tools including corn shellers, wheat grinders, and washtubs. They will also discover Ohio’s Native American influence through the story of the “The Three Sisters” and by grinding corn. As a special treat, students will make their own butter! For more information on homeschool programming, please email [email protected]. Check our Facebook page for event updates and to share with your friends!